Rico’s | Brimfield, Ohio | dreaming of the next bite. Well it’s no news that my dad knows good food; he’s been all over the country eating at some of the greatest restaurants over the course of his life. He certainly appreciates food, but in a different way than I do. He’s old school; you wouldn’t catch the man eating sushi for example, he’s traditional. But of course Italian is at the top of his favorites list, being born and raised in the Midwest and all. Pasta is basically a food group in NE Ohio. So Dad told me everything on the menu is good because of the sauce. I went for the lasagna, although his first recommendation was the veal parmigiana. 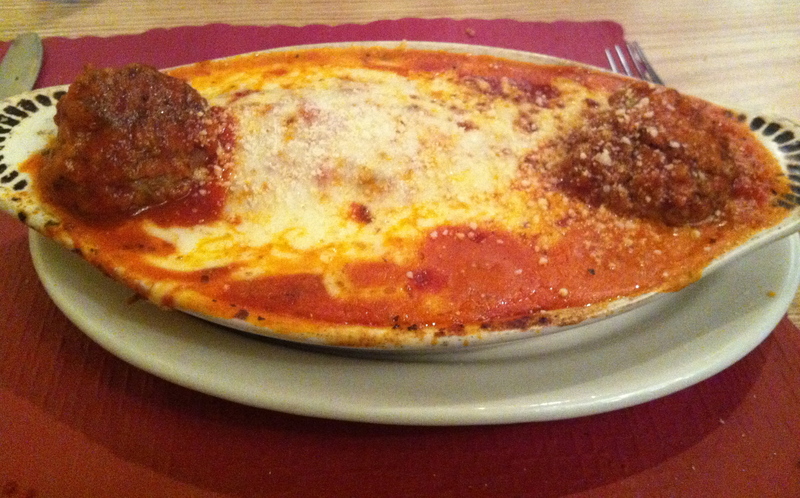 The lasagna comes with a choice of either meat sauce, or marinara sauce with meatballs, so I opted for the meatballs. As I remember, the lasagna is actually meatless, so you vegetarians could enjoy this one, too. While there was more sauce on this plate than necessary, the sauce itself was truly fantastic. The lasagna was cheesy and meatballs were well-seasoned, tender, and flavorful. 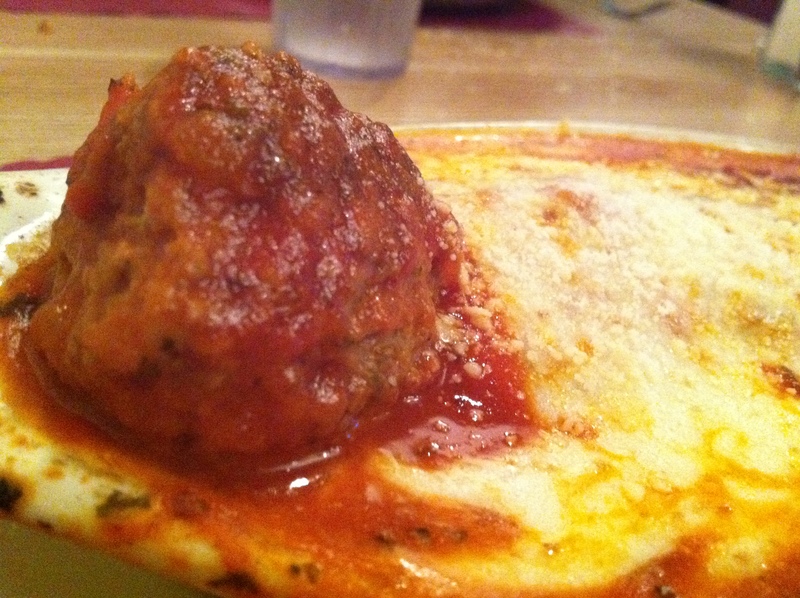 I had to get this shot so you can begin to appreciate the sheer size of this meatball. I could have eaten a whole bowl of just meatballs, sauce and melted mozzarella – which is actually what I order sometimes at Luigi’s when I’m trying to cut carbs. Clearly carbs were no object this time. 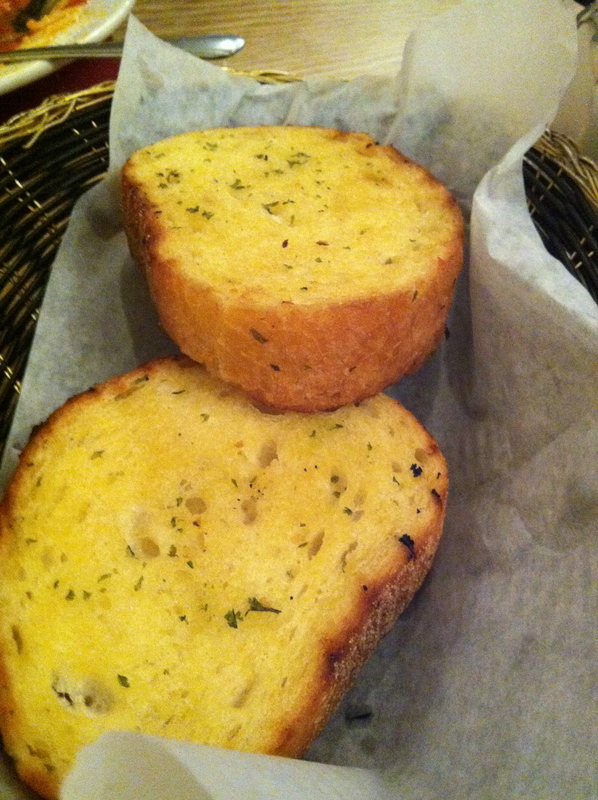 Bring on the garlic toast. So yeah, I should probably get a little more vigilant with my trips to the gym if this keeps up. 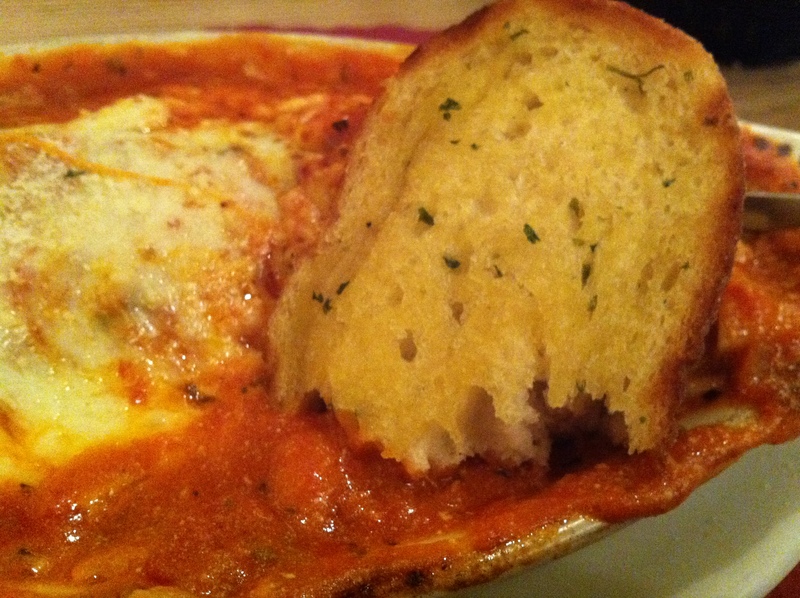 You should know that I ate every single bite of the lasagna, meatballs, and two slices of garlic toast – and enjoyed every second of it. What a wonderful Italian meal. Thanks to my Dad for finding the place! I have to give you the address, since Rico’s web presence is basically non-existent. Next step: get them on UrbanSpoon – this little Brimfield secret must be shared! Rico’s Restaurant: 1332 Tallmadge Road, Kent, OH 44240. This entry was posted in Akron, OH by Yvette (@foodiedreamer). Bookmark the permalink.